Product information "Nimba LED Pendant Light"
The Nimba LED pendant light attracts attention by its exceptional form language. 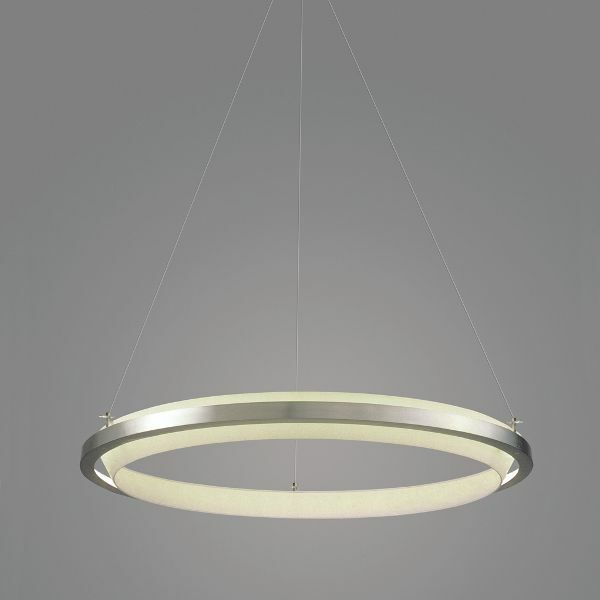 A high quality stainless steel ring seems to weightlessly hold the plastic ring again that acts as light source. This design by Antoni Arola is only realizable by the use of the latest LED technology. The Spanish manufacturer Santa & Cole offers this lamp in different sizes. Canopy Dimensions in inch (WxHxD): Ø 12.6" x 2"
Max. Total Height in inch: 19.7" - 196.8"
Dimensions S in inch (WxHxD): Ø 23.6" x 3.1"
Dimensions M in inch (WxHxD): Ø 33.5" x 3.1"
Dimensions L in inch (WxHxD): Ø 47.24" x 3.15"
Related links to "Nimba LED Pendant Light"